Now that last weekend’s Quilt Market in Portland has wrapped up, we can get a peek at what it was all about! But wait, “What the heck is Quilt Market?”, you ask? Quilt Market is one of the largest trade shows for the art and business of quilting organized by Quilts, Inc. There are usually two Quilt Markets organized by Quilts, Inc. yearly; in 2o13 the first was in Portland last weekend, and the second will take place in Houston, TX on October 26-28. Quilt Market is a place for quilting businesses and tradespeople to show off their wares, new products, and fabric lines. So, getting to see photos of the booths and products after market can be a little like getting a peek at fun things coming to a quilt store near you. Totally awesome, right? So let’s see what we missed! Sew, Mama, Sew! shared a pair of great posts with lots of great photos of booths, check out Quilt Market Fun: Part One and Quilt Market Fun: Part Two. 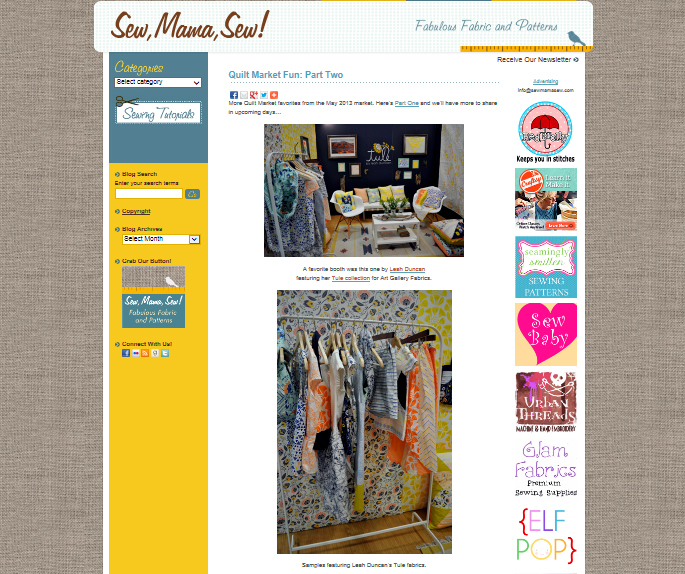 One Lucky Day also shared loads of great photos of booths and projects (did you SEE that selvage dress?). 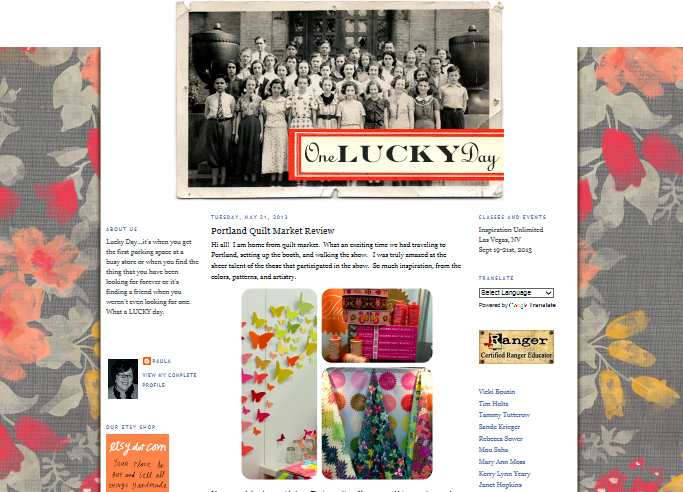 Check out Portland Quilt Market Review. Also, visit Pokey Bolton’s review of the event including some great conversations with new fabric designers Tim Holtz and Carrie Bloomston. If you like browsing through photos, you can also try one of my favorite things – perusing photos of the event at flickr. This is my version of relaxing and reading the paper at the end of the day; first I get a cup of tea, then I sit in a comfy place with my laptop, open up flickr and search for photos from the event. If you’d like to give this a try, click here to peruse photos from Quilt Market Portland at flickr. And speaking of quilting, as a member of the Chicago Modern Quilt Guild I have noticed that neon colors are starting to catch the eye of some modern quilters. So I wasn’t surprised to see the Portland Modern Quilt Guild blog about this quilt project – in neon! – being exhibited at Quilt Market in Portland. Keep your eyes open for those neon fabrics! Next Next post: Congratulations to our BERNINA WeAllSew Fabric Design Contest Winners!